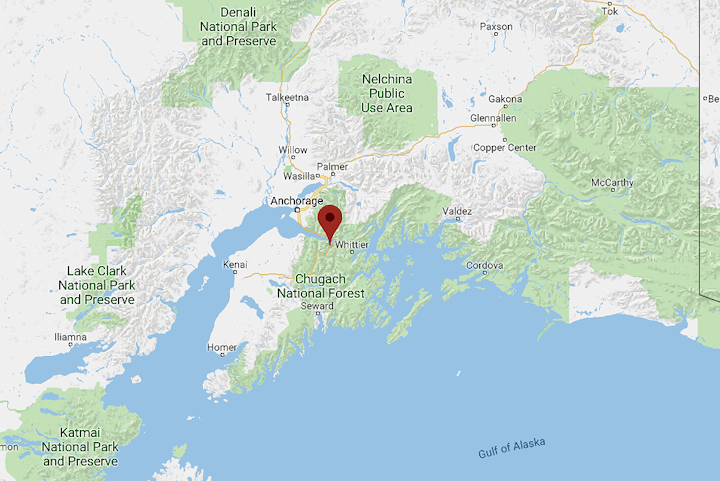 Green means Go in the Chugach! 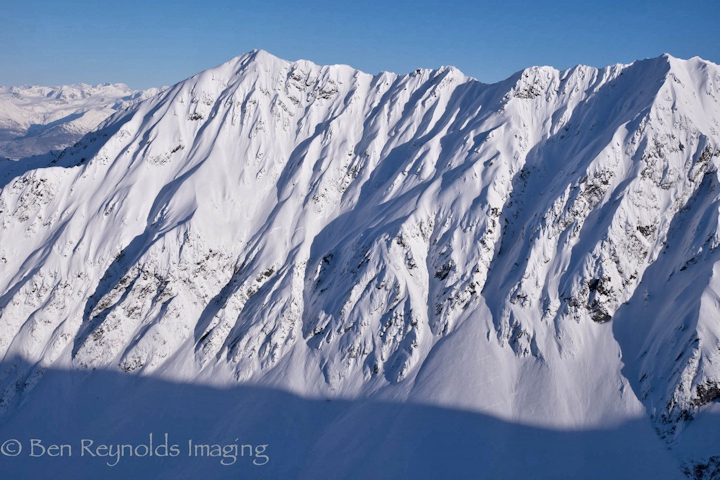 Turnagain Pass suffered from a low snow depth and poor snowpack structure this year. However, after a week of calm winds and high pressure, the snowpack started to stabilize, and the forecast went to green. 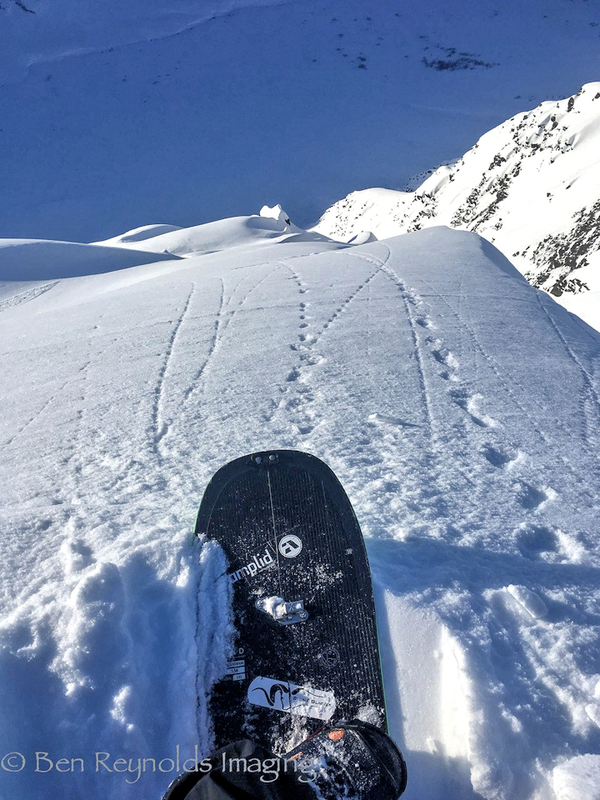 My good friend and fellow Amplid ambassador, Orin Rolando, made plans to head deep into a zone that holds steep spines and featured faces in the Chugach. We awoke at 5am and were on our way, striding through the forest by headlamp, before 8am. Deciding to forego the first set of lines saved us considerable time and allowed us to proceed directly into a higher valley with direct access to the lines we had set our sights on. After breaking trail for 4 hours with our Milligrams, we swapped our splits for Vert snowshoes and started climbing the steep line. Waist deep, low density pow made for slow but steady progress. 90 minutes of climbing took us to the ridgeline. The last portion of the climb was 60-degree rock covered in a few inches of snow. Lacking crampons, I attempted the final pitch in my verts and using my whippet (an ice-axe-like blade and ski pole combination used by mountaineers when an ice-axe isn’t deemed necessary). I soon realized that I was in an exposed position and unable to safely make the next few moves. Very carefully I removed the Verts and committed to the next few moves. I used my whippet to dig foot and hand holds into the rock-hard snow giving me securing as I crossed the exposure on the north side of the ridge. Topping out into the morning sun was a relief. 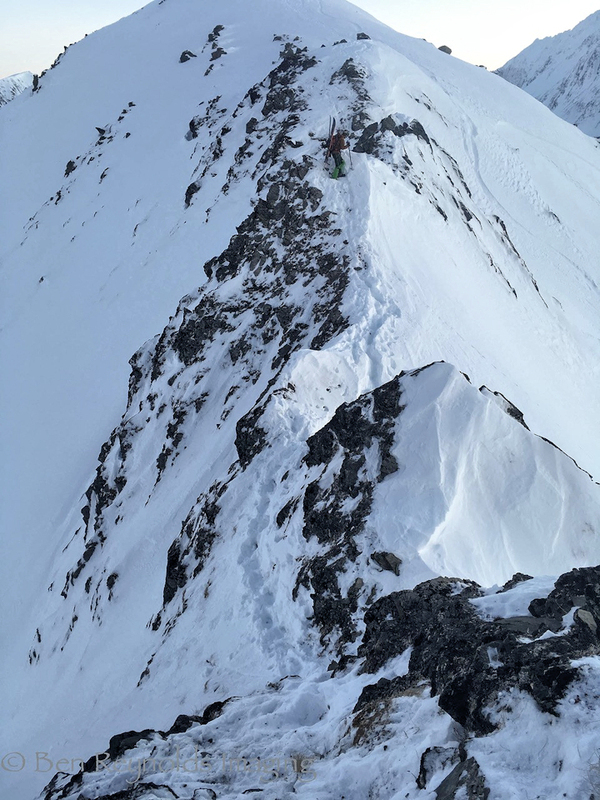 I was filled with excitement, realizing that I was going to be able to drop into my line from the very top. Mountain Goat tracks surrounded my elevated perch as I switched to ride mode. After communicating with Orin, who was just below me in the saddle below the technical pitch, I eased-out onto the top of the line to get a better view of the first section. It quickly rolled over out of sight. 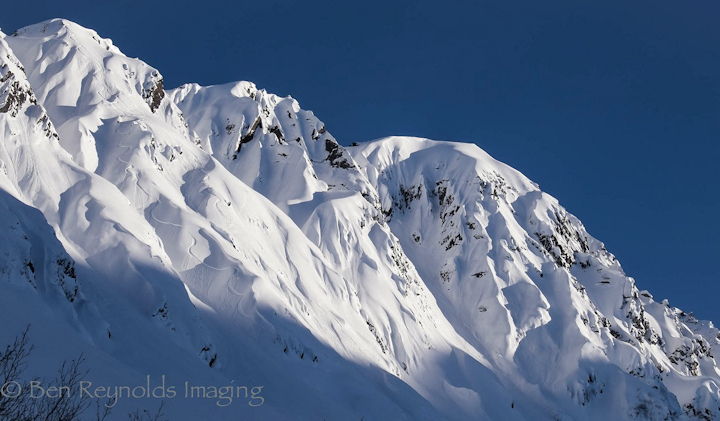 The light and airy powder glistened in the sun. These are the moments that my dreams are made of! With a deep breath, I leant forward and dropped fall-line into the first spine. Very quickly I was surrounded by sluff, so I aired onto the next spine. The sluff hit the sides of the spine and shot into the air like a cascading torrent. 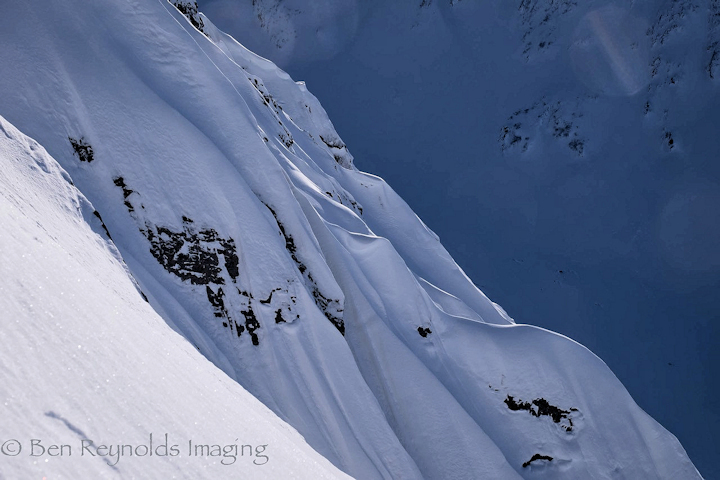 My line choice took me down a steep traversing sidewall, from one spine to the next. The last time I rode on this face I made the error of letting too much sluff build behind me and almost lost control twice as the moving snow attempted to sweep me off my feet. This time I proceeded with a touch more caution, which resulted in a cleaner line. Orin dropped a similar line and rode confidently, gradually traversing in the opposite direction, taking him to untouched snow. I watched as the sluff waterfalled down the line below him. Our exit from this line included a steep, skin-track ascent of 2000 ft and a half mile hike across a ridge. The deep snow had slowed our progress, but we had the privilege of watching the sun set while still navigating the ridge. Orin didn’t quite share my sentiment in this regard and was quite anxious to finish the slightly technical traverse before darkness fell upon us. Finally, the ridge behind us, we switched once again to ride mode by headlamp. 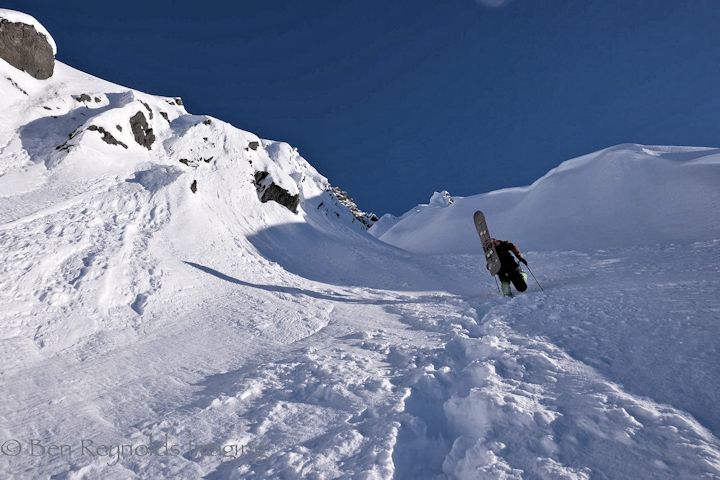 The run started on a steep headwall and led down into a long moderately angled tree run with blower pow. We dropped in together in the dark by headlamp, confident in the stability and lack of avalanche danger in this familiar terrain. A long run, in perfect snow, by headlamp is incredible: You get face shot after face shot and then look around to see your partner making turns and lighting up the snow! 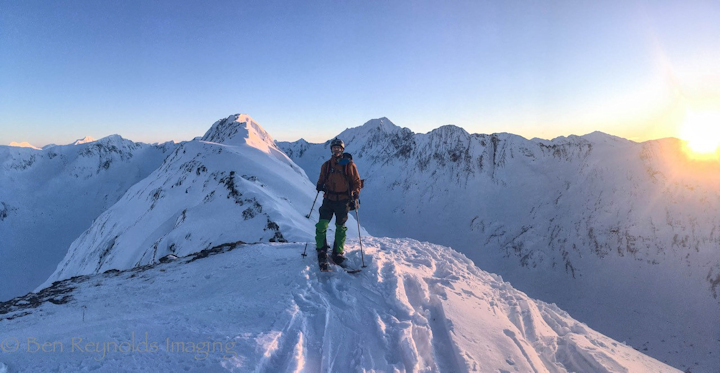 We returned to the truck 10 hours after starting, but when the light goes green in the Chugach, you go after the trophy lines!